Recently, battery systems have been in the news and on the minds of many. Many in the media have whipped out calculators, but I decided to build one so anyone can compare pricing. The challenge, however, is finding credible information amongst all the hype. Much of the hype centers around how battery system pricing is discussed. Because energy storage is about storing energy, a common mistaken assumption is that the energy price, $/kilowatt-hour ($/kWh), is important to understand the value of a storage system. In fact, when creating an energy storage project finance model, it is important to have a clear sense of the capital costs, operating expenses, and anticipated project revenues. Of the three, only project revenues use $/kWh units; both CapEx and most fixed OpEx should use the power price, $/Watt ($/W) as this value is aligned with the (tax) incentives, fees, and generation costs such as for solar, diesel, wind, and hydropower. On the revenue side, setting a $/kWh sale price for the generated electricity aids sensitivity testing and determining the returns and viability of the project. Try out this calculator to see how power and energy pricing differ. 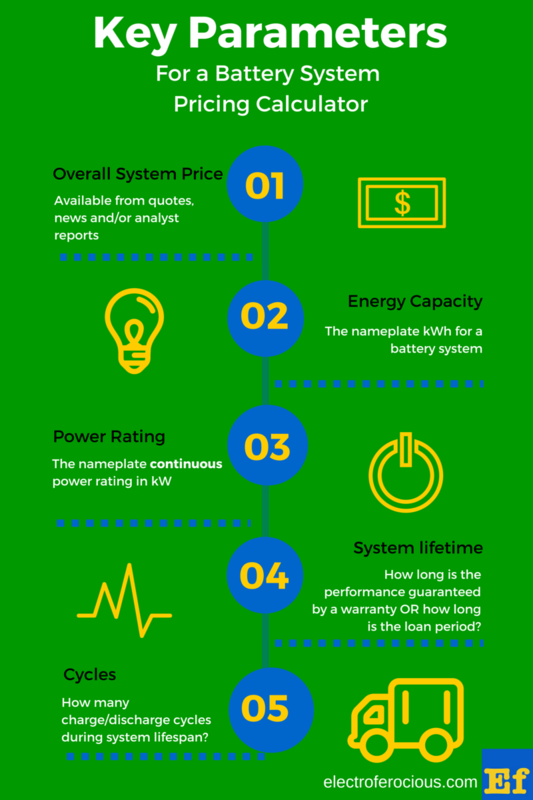 When you evaluate several different battery systems, you get a better idea of what the comparative value of a battery system offering is. Unfortunately, this calculator does not include operating expenses such as insurance, operations & maintenance costs, and end-of-life costs. For simplicity, this calculator uses $/kW for the power price.